Need a little spring detox? Yeah, me too. 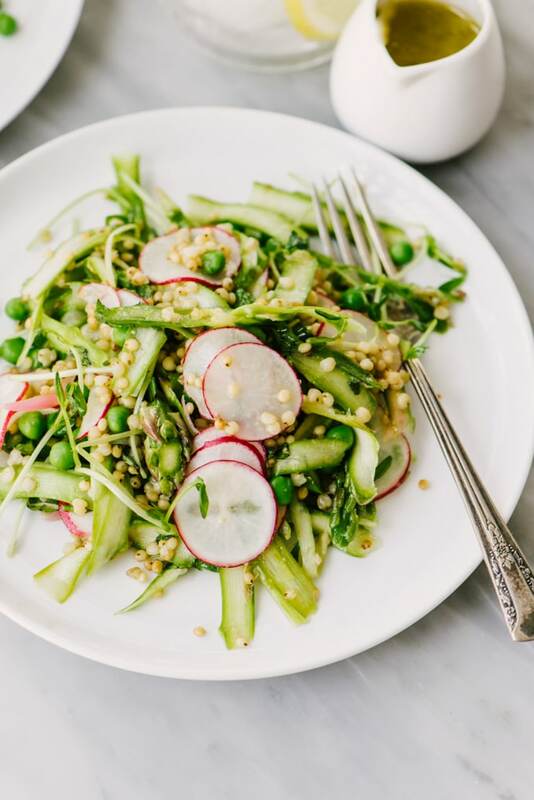 Enter this spring sorghum salad with raw vegetables! It’s vegan, gluten free, and packed with fiber, vitamins, antioxidants, and most importantly – flavor! Sorghum holds up well in the fridge, so this is an excellent big salad recipe to toss together on the weekend and tuck into at lunchtime all week long. Two weeks ago Cameron and I spent a long weekend in Nashville, where we attended the wedding of good friends, and took a few extra days to unwind. 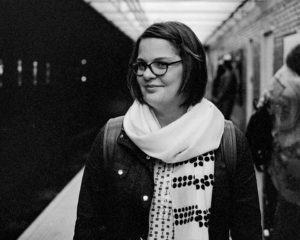 It was our first trip sans kids in…well, ever. Consequently we were as indulgent as possible, and spent a solid three days eating whatever we wanted, napping whenever we wanted, and generally lazing about. On our first Lyft into downtown, the driver warned us about the “Tennessee 20”, and his prediction was spot-on. We arrived home on Sunday evening stuffed with biscuits, hot chicken, and more avocado toast than one should reasonably consume. I regret nothing, but I’d be lying if I said we didn’t need a serious detox. All of the vegetables, please and thank you. As far as I’m concerned, there’s no better way to detox than with a super green grain salad. I love the combination of raw vegetables alongside warm grains. The variety in texture keeps every bite interesting and fresh. 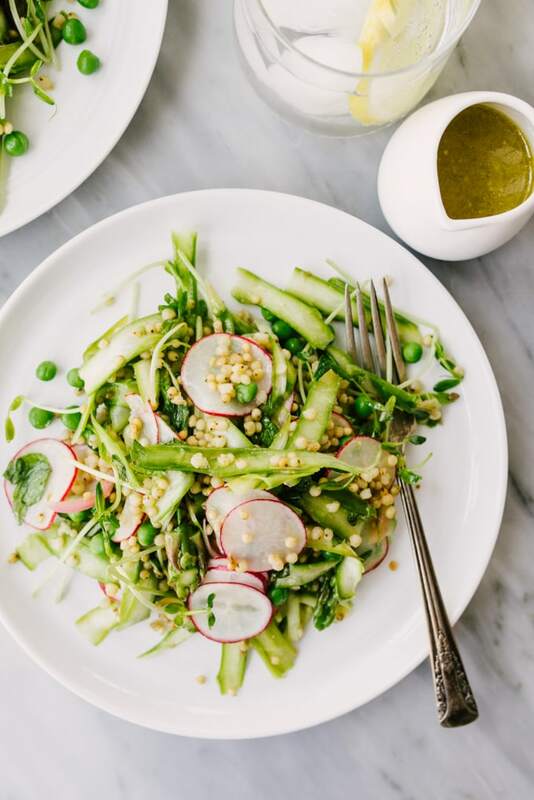 This sorghum salad with spring vegetables is packed with protein, fiber, and healthy punches of vitamins and antioxidants. It’s vegan and gluten free, but don’t let those healthy buzzwords fool you. This salad is bursting with flavor, and it’s extremely filling and satisfying. Pin it now! 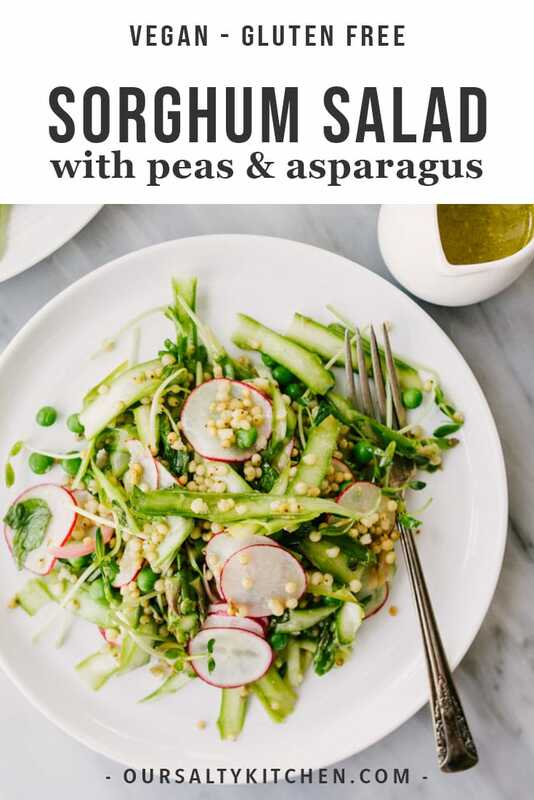 Click here to add this Sorghum Salad to your Spring Recipes board on Pinterest. 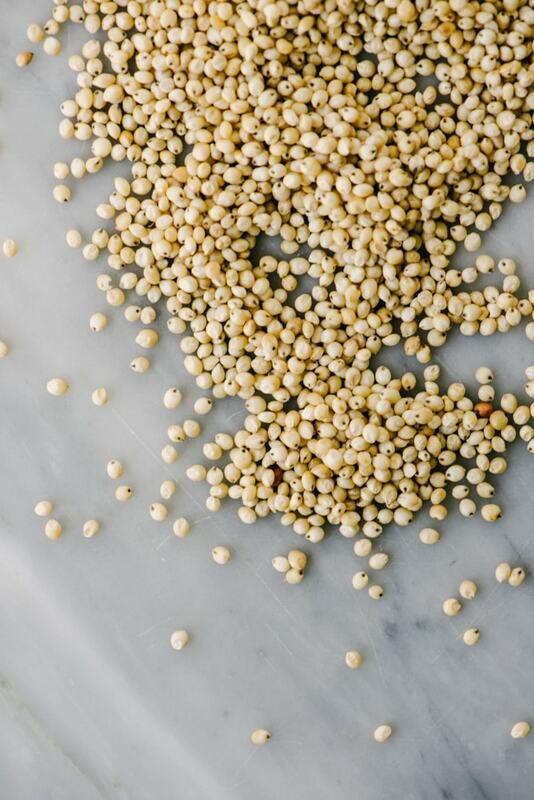 Sorghum is a gluten free ancient grain that’s sort of a mash up between wheat berries and Israeli couscous. It’s chewy and nutty, but still mild enough to go with just about anything. It’s packed with fiber, protein, and complex carbohydrates so it’ll fill you up and keep you full. Toss it up with a whole mess of raw veggies and you’ve got yourself a bowl of superhero food. Sorghum takes awhile to cook, so you need a wee bit of patience for this recipe. After cooking for about an hour, it’ll be soft but still chewy, and very nutty in flavor. It’s firm enough to last in the fridge for several days without the slightest hint of sogginess, and for that reason this sorghum salad is perfect to toss together on a Sunday afternoon and enjoy throughout the week. The primary vegetable color palette here is green. All of the green things! I kept everything raw to keep the prep nice and easy. Sorghum takes a bit of time to cook, so feel free to start the prep about half an hour or so into the cooking process. Start by shaving a one-pound bunch of asparagus. 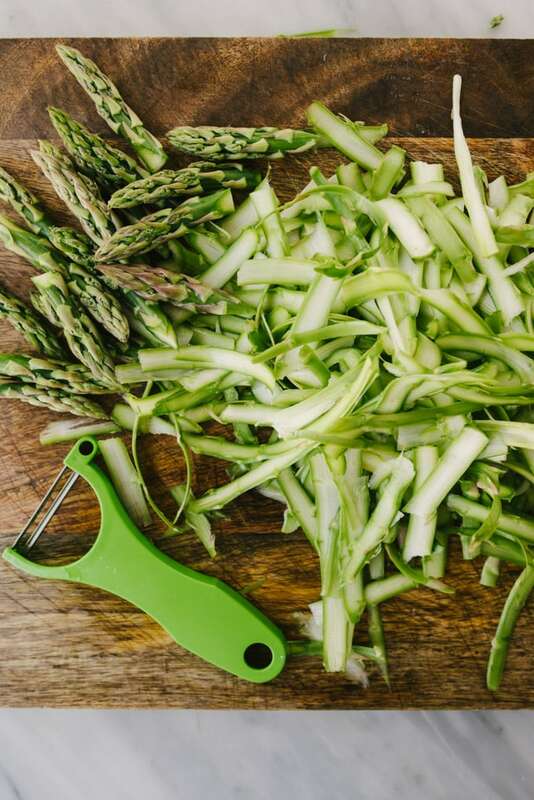 Place a piece of asparagus on a cutting board and then shave off thin strips using a vegetable peeler. You can make the peels short or long, just try and keep thin so they can soak up the lemony vinaigrette flavor. Add the shaved asparagus to the warm sorghum along with a few handful of peas shoots and about half a cup of vinaigrette, then toss. Green base – accomplished! Add in some sweet peas, picked red onions, shaved radishes, and a sprinkle of fresh mint, then toss again. Feel free to mix and match the vegetables based on what you have available. Cucumbers, cherry tomatoes, shredded carrots, edamame…it all works here. Green grain detox salad glory. YUM. This salad makes for six generous servings and it’s a complete meal on it’s own. It’s an excellent lunch served cold or room temperature. PIN IT NOW, MAKE IT LATER! 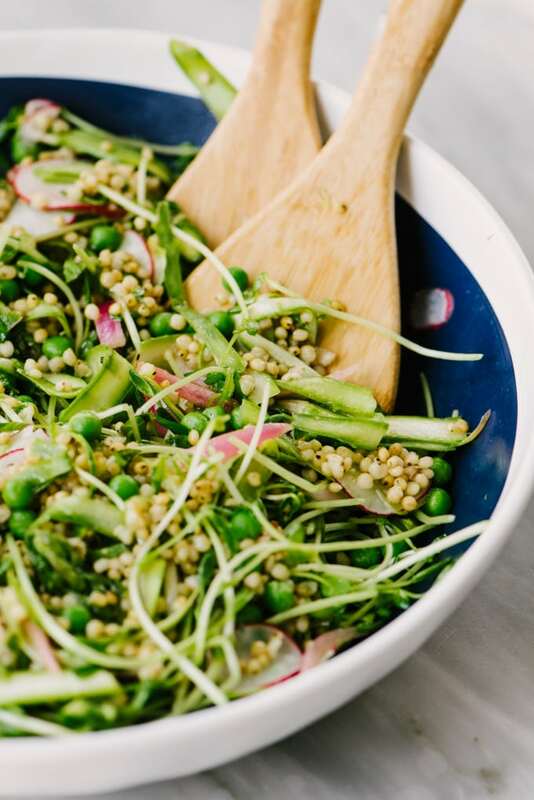 CLICK HERE TO PIN THIS RECIPE FOR SPRING SORGHUM SALAD. 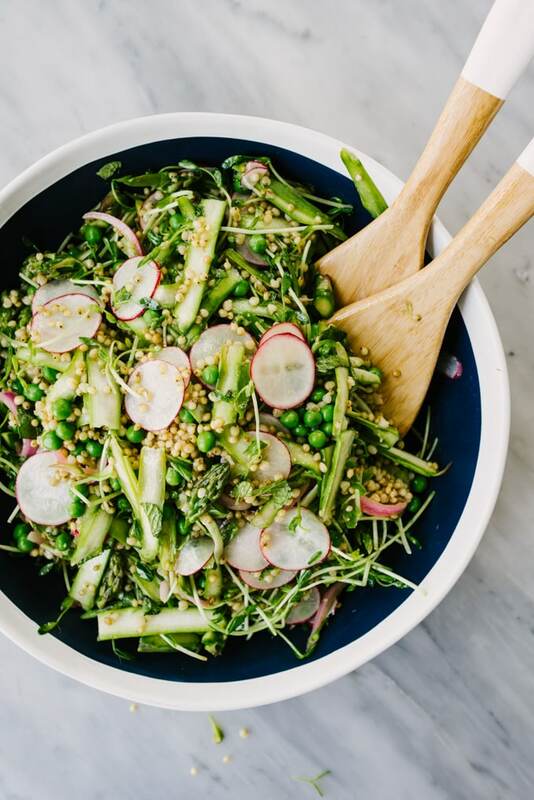 This spring sorghum salad with raw vegetables is vegan, gluten free, and packed with fiber, vitamins, antioxidants, and most importantly - flavor! It's the perfect spring detox salad. This salad holds up well and is perfect for weekend lunch prep. Place the sorghum into a fine mesh strainer and rinse with cool running water to remove some of the starch. Combine the rinsed sorghum with 3 cups of water or broth and a teaspoon of salt in a small pot over high heat. Bring the water to a boil, then reduce to medium low, cover and simmer until the water is completely absorbed and the sorghum is soft but chewy, 50-60 minutes. Check the sorghum around the 45 minute mark and add additional water if needed. Snap the woody ends from the asparagus spears and discard. 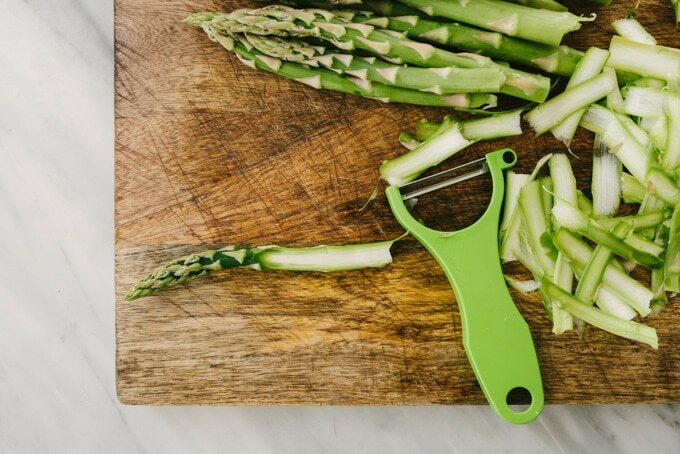 Using a vegetable peeler, shave the asparagus into thin strips. Starting just under the tip of the asparagus, run the peeler down the length of the stalk. For smaller strips, start in the center of the stalk and peel completely. Then return to the top of the stalk, just below the tip, and peel. Repeat until each stalk is shaved, then coarsely chop the tops into bite sized pieces. In a small bowl, combine the whole grain mustard, honey, champagne vinegar, lemon juice and zest, and salt and a pepper. Whisk until incorporated. Add the olive oil in a steady stream and whisk until emulsified. 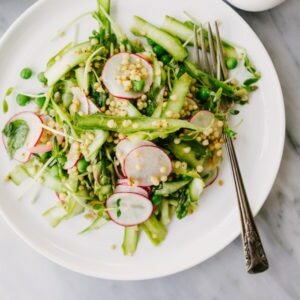 Toss the warm sorghum grains with the shaved asparagus, pea shoots, peas, radishes, mint, and red onion. Dress with half a cup of vinaigrette, then toss until thoroughly mixed. Serve immediately. This sorghum salad keeps in the fridge in a tightly sealed container for up to 5 days, and can be enjoyed cold or room temperature.